(Figure 1). Schematic representation of a SPAAC ligation reaction. The strain promoted alkyne-azide cycloaddition, also termed as the Cu-free click reaction, is a bioorthogonal reaction utilizing a pair of reagents, cyclooctynes and azides that exclusively and efficiently react with each other while remain inert to naturally occurring functional groups such as amines (Figure 1). SPAAC enables labeling a wide variety of biomolecules without any auxiliary reagents in an aqueous and otherwise complex chemical environment through the formation of a stable triazole. Among the large number of known cyclooctynes, the so-called DBCO (dibenzocyclooctynes) compounds comprise a class of reagents that possesses reasonably fast kinetics and good stability in aqueous buffers. Within physiological temperature and pH ranges, the DBCO group will not react with amines or hydroxyls that are naturally present in many biomolecules. Additionally, reaction of the DBCO group with the azide group is significantly faster than with sulfhydryl groups (–SH, thiol). 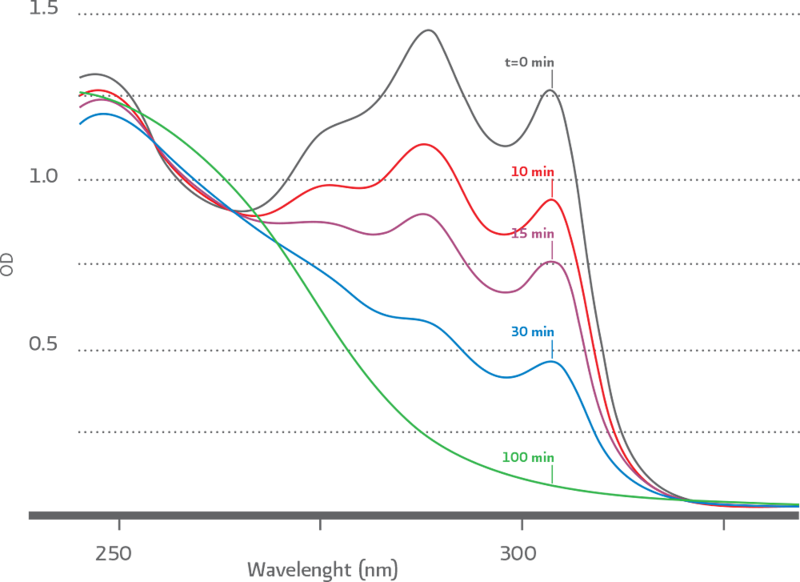 Unlike many other cyclooctynes, DBCO reagents possess an embedded chromophore that allows for the simple and non–destructive spectroscopic identification of DBCO – containing compounds. This chromophore can also be used for spectroscopic estimation of total incorporated DBCO molecules into a biopolymer. (Figure 2). Progress of SPAAC ligation reaction followed by UV–Vis spectroscopy.